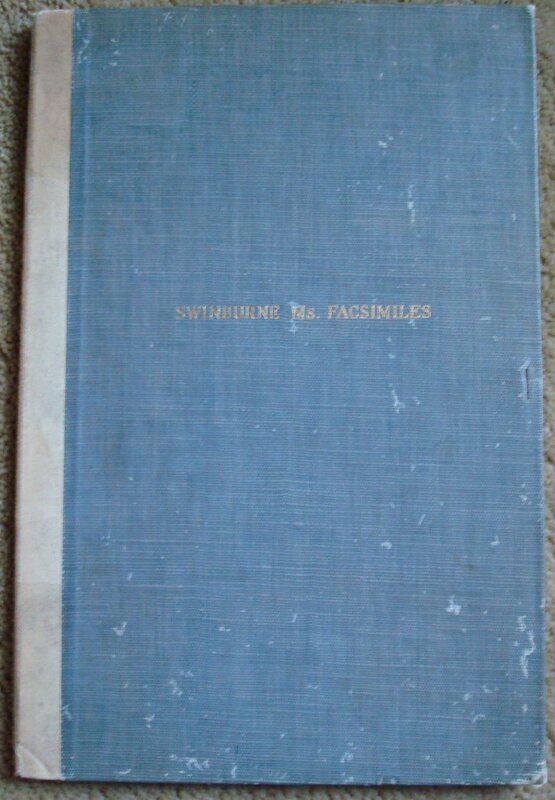 For sale is an ex-library facsimile copy of an essay by Algernon Charles Swinburne. This item consists of thirteen sheets on blue paper in Swinburne's hand containing the author's essay, "Mr. Whistler's Lecture on Art." This essay is said to have caused the estrangement between Swinburne and James McNeill Whistler that lasted until Whistler's death. The item is cased in a grey buckram folder with white buckram spine. The case shows moderated to heavy wear, the spine has been reinforced with tape. The corners and spine caps show some bumping and wear. There are some library labels and a card pocket on the inside front cover. The manuscript pages show some light fading and creasing around the edges. The first page has a small library stamp at the top center. Published by the Bibliophile Society of the United States, no date given. Scarce item in any condition.